This September 8th is World Physiotherapy Day, a global event that aims to celebrate the role that Physiotherapists play in keeping us well, mobile and independent. Building on the findings of the World Health Organisation’s (WHO) World Report on Ageing and Health, the theme for this year’s event is ‘Add life to years’. As our ageing population continues to grow, (with an expected 2 billion people over the age of 60 by the year 2050) the focus of the campaign is the contribution and cost effectiveness of physiotherapy in healthy ageing. To mark the occasion, we’ve put together a collection of resources available from St George’s Library to our support our students and Physiotherapists in practice. We’ve also highlighted some other useful links, including websites, tweet chats and other social media tools that may be useful in supporting Physiotherapists throughout their career. Continuing the Library’s new series of monthly promotions – Library Loves – this February we are taking a closer look at Point of Care Resources – what they are, and what’s available via St George’s Library. Point of Care Resources refers to a range of resources that are designed to make the latest research and guidance available to healthcare staff/students at the ‘Point of Care’ in order to support their clinical decision making, and enable the practice of Evidence Based Healthcare. Point of Care in this context simply means any location that is in the vicinity of patient treatment – from the patient’s own home, to the GP’s consulting room or the hospital bedside. Evidence Based Healthcare (EBH), also referred to as Evidence Based Medicine (EBM), is the practice of applying high quality, up to date evidence in the process of clinical decision making, alongside the expertise and experience of the healthcare practitioner and the needs of the patient, enabling the most appropriate course of treatment to be identified. Clinical Evidence, one of the resources we will look at in more detail below, includes an excellent introduction to Evidence Based Medicine in their Learn EBM section. There is also an Evidence Based Healthcare section on our Library website, where you can find more information. 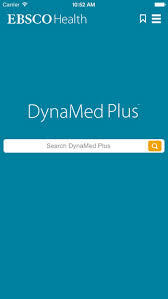 DynaMed Plus is an evidence-based clinical decision support tool. It covers over 3,400 clinical topics, reviewed by doctors, and provides diagnostic information as well as evidence-graded treatment recommendations. Each summary is split into easy to navigate sections, and many summaries will provide external links to supporting webpages and articles, displaying the abstract or full-text article where available. Content is updated daily and users can opt-in to receive alerts on the latest updates in their specialties. The topic summaries provide links to relevant BNF entries, NICE guidelines, Micromedex Drug Content, images and graphics. Device information: The website is device responsive so can be used in the web browser of any desktop, laptop, tablet or mobile provided you are connected to the internet. There are also DynaMed Plus apps for Android and Apple iOS (iPhone and iPad) – there is more information about the DynaMed Plus apps in our Guide to Mobile Resources Blog. Via the DynaMed Plus mobile app (detailed download instructions can be found in this feature from our Guide to Mobile Resources Blog). BMJ Best Practice describes itself as ‘your instant second opinion’, bringing together the latest evidence, guidelines and expert opinion on over 900 topics to support your decision making. Topics are arranged in a standardised way including overview, diagnosis, treatment, and follow-up sections to mirror the structure of a patient consultation. Each topic also includes a resources section where you can view a full list of references with links to the abstract or fulltext where available, online resources, images and patient information leaflets to support the idea of shared decision making. Device information: The website is device responsive so can be used in the web browser of any desktop, laptop, tablet or mobile provided you are connected to the internet. There are also BMJ Best Practice Apps for Android and Apple iOS (iPhone and iPad) – there is more information about the BMJ Best Practice app in our Guide to Mobile Resources Blog. Access: Use the relevant links in the BMJ Best Practice entry on our databases page. The BMJ Clinical Evidence team carry out systematic reviews of the evidence available on each topic, which is then presented in various summarised ways to make the findings easy to access and interpret in relation to clinical scenarios. Each topic includes an overview that also highlights any significant developments since the last review was published, background which includes the definitions of terms and methodology for the review, links to relevant patient information, guidelines and references. However, the key features of Clinical Evidence are the interventions tables and the GRADE tables; interventions tables rank interventions on a scale to indicate how likely they are to be beneficial, while GRADE tables use GRADE (a system developed by the Grading of Recommendations, Assessment, Development and Evaluations Working Group) to assess the quality and strength of the evidence available for key interventions. Device information: The website is device responsive so can be used in the web browser of any desktop, laptop, tablet or mobile provided you are connected to the internet. There are currently no apps available for this resource. Access: Use the relevant links in the Clinical Evidence entry on our databases page. We will be showcasing these Point of Care Resources, alongside the rest of the Library’s services and resources. Interested in learning more about Evidence Based Healthcare? Book a place on our EBH training session. DynaMed Plus is now available to all St George’s NHS staff. DynaMed Plus is an evidence-based knowledge system that helps clinicians make the right decisions at the point of care. It contains over 3,400 clinic topics, reviewed by doctors, providing evidence-graded treatment recommendations as well as diagnostic and other information. Evidence is synthesized according to an explicit methodology to provide objective analysis. DynaMed Plus includes links to relevant BNF entries; NICE guidelines; Micromedex Drug Content; images and graphics; calculators; a mobile app for information on the go and more. See below for instructions on how to download and authenticate the DynaMed Plus app. Click on the Mobile use – Get the DynaMed Mobile App link under Spotlight. 5. Open the email from your mobile device and follow the links to download the app via the iTunes Store or Google Play. 7.The DynaMed Plus App opens on your device and begins the initial content download. Once you download the app, you can search DynaMed Plus content offline from your device. Approximately 180 million articles related to medicine are accessed on Wikipedia every month. It is a heavily used resource for health related information and its use is reliant on this information being up to date and accurate. The Cochrane Collaboration and Wikiproject Medicine teamed up earlier this year to improve the accuracy of medicine related articles to ensure that they contain well-referenced, high quality information. Students 4 Best Evidence, a global network of students interested in evidence-based medicine, have joined the Cochrane Collaboration and Wikiproject Medicine in their efforts by launching Wiki Week. Wiki Week will be running from Monday 15th September to Friday 19th September and is intended to encourage and teach students interested in evidence-based medicine how to improve health related articles on Wikipedia. Student’s 4 Best Evidence (S4BE) will be updating their website with articles, resources and tutorials aimed at helping students to learn how to edit Wikipedia effectively. There will also be a Wiki Edit-a-thon on Tuesday 16th September at 12pm BST. The Wiki Edit-a-thon will take place at the UK Cochrane Centre, in Oxford, but for those who can’t make it to Oxford, there will also be an online edit-a-thon simultaneously taking place using Google Hangouts. If you think you might be interested in contributing to this great project then you can get involved by following the links below. BMJ Case reports is now available to NHS Staff and SGUL staff and students. An award winning journal that delivers a focused, peer-reviewed collection of cases in all disciplines so that healthcare professionals, researchers and others can easily find clinically important information on common and rare conditions. This is the largest single collection of case reports online with more than 5000 articles from over 70 countries. Select St George’s University of London from the drop down list. Log in with your Shibboleth username and password. Log in with your NHS Athens username and password. Following the recent outbreak of Measles in the UK, you may want to find out more about the disease. One way of finding up to date information and evidence regarding the treatment and prevention of the disease is by logging on to BMJ Best Practice. University Staff and students should use their institutional (Shibboleth) username and password. Below is the Best Practice summary of the disease, covering treatment and prevention details to help keep you up to date. If you want to read more on this please click here. Measles is an epidemic disease prevalent worldwide whose incidence has been curtailed markedly in countries where immunisation is widespread. It is characterised by cough, coryza, conjunctivitis, a characteristic exanthem, and a pathognomonic enanthem (Koplik spots). Measles is preventable by immunisation, but high levels of coverage are required to prevent outbreaks of disease. Treatment is primarily supportive, and complications of measles are more common in immunocompromised and poorly nourished individuals and include pneumonia, laryngotracheitis, otitis media, and encephalitis. You can view the Best Practice Prevention information on measles here, or Treatment information here. For the latest 50 updated topics added to Best Practice, click here. As part of a free trial from St George’s Library all members of St George’s NHS Trust now have access to DynaMed via EbscoHost via their Athens account. How do I access DynaMed? To access Dynamed you will need your NHS Athens username and password. If you do not have one you can complete the online registration form here or click here if you have forgotten your password. Once you have your NHS Athens details login to DynaMed to start searching. You can also download the DynaMed app to use on your mobile device. Contact the library for a serial code: library@sgul.ac.uk Instructions are available online for iPhone, iPad, Android, Blackberry and Windows users. Our Pop Up Library will be at Atkinson Morley Reception on Wednesday 17th April between 12 and 2pm. Our staff will be able to demonstrate and answer questions on DynaMed and other resources available from St George’s Library. Alternatively email Karen John-Pierre kjohn@sgul.ac.uk for further information.